Thinking of relocating the family to a new city and settling down? Plant your feet in one of the friendliest cities in the Midwest. Minneapolis, Minnesota has increased in popularity for families looking for a fun and friendly place to call home. Known for popular attractions such as the Mall of America and the Minneapolis Sculpture Garden, there is so much more to this Midwest city. From excellent school systems to activities the whole family can enjoy over the years, Minneapolis is a secure choice. Here are five reasons to pack up and move the family to Minneapolis. Your children’s education is a vital factor to consider when deciding where you choose to raise them. Having access to high quality education can be a huge contributor to your children’s future. Fortunately, Minneapolis is known for having a great choice of schools. Being a big city means countless choices for both public and private education, so you can steer the ship of your child’s education. In the Minneapolis School District alone there are 98 schools that are fully equipped to give your children the education you’ve always wanted for them. If you decide to plant down in the southwest region of the city, you’ll be set for good schooling from the moment your child walks into kindergarten to the moment they toss their cap at their high school graduation. Lake Harriet Lower Elementary School and Lake Harriet Upper School rank as two of the best schools in all of Minneapolis. Of course, there are many other acceptable schools in the city, regardless of where you end up. From toddler to teen, Minneapolis has a variety of fun opportunities for the kids to enjoy throughout their whole childhood. Take the tots to the Children’s Museum for an educational adventure. The fun doesn’t stop once they get older and want to explore their own unique interests! Your little actors can take to the stage at the Children’s Theatre Company and get a taste of the arts. The Como Park Zoo and Conservatory is also a family favorite for all ages, engaging your budding zoologist. There are many attractions and opportunities in Minneapolis to engage your kids at each stage of their childhoods. In Minneapolis - just like Minnesota in general - the folks are plain friendly. Minneapolis ranks as the 7th safest city in the country and Minnesota ranks in the top five states to grow up in. Nearly all neighborhoods within the Minneapolis/St. Paul area rank high overall as a community. Low crime ratings, great school systems and affordable living all add up to a well-rounded neighborhood to raise a family. Safety, security and overall satisfaction with the quality of life make Minneapolis a cherished place for those growing up there and growing old. It’s a place you can give your children a happy childhood and enjoy the older stages of your life. Although it’s a metropolitan city, Minneapolis does not take being outdoors lightly. The park system operates nearly 200 parks, so all residents are fortunate to live near at least one park. Close proximity to well-maintained parks gives your children plenty of play space and opportunities to explore nature. In addition to a top rated park system, Minneapolis is home to tons of biking and walking trails. You can gather the tribe for a weekly stroll or bike ride through the city. 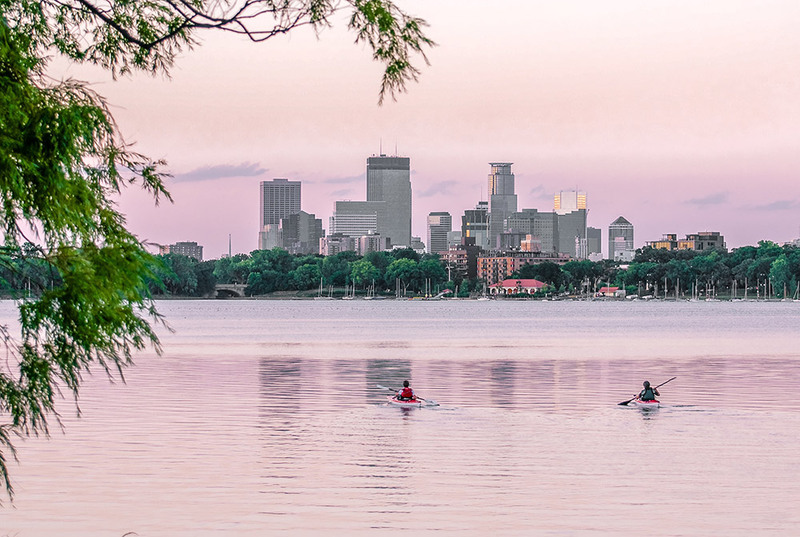 Minneapolis also is home to nearby lakes and beaches, perfect for a relaxing family staycation. Lounge on the shore of Lake Calhoun or strap in the gang for a day of kayaking the lake. This urban beach offers kayaking, sailing and paddle boating for all your water needs. Minneapolis residents’ value their health and take advantage of being in close proximity to a large mass of agricultural land. If the importance of living an active lifestyle isn’t enticing enough for your growing family, the supply of fresh and nutritious produce should seal the deal. Your little ones will grow up strong and healthy with many good options for food readily available. Plus, you can keep your older kids away from the junk and get them cooking early on. Find the best produce at the Minneapolis Farmers Market which has hundreds of vendors and stays open all year round. You really can’t ask for more than great schools, extracurricular activities, safety and healthy choices when looking for a place to raise your family. Find all that your family could want and more in Minneapolis. Hop on the bandwagon fast and find your home in Minneapolis, because once people move there, they tend to stay.